Pink Guava, i dont get this ultimate fruit here in Paris, but still am posting a fabulous smoothie which i blended together with an another incredible ingredient. I had an immense chance to enjoy this fruit thoroughly during my last year's trip to India. Its was a peak season in India during my travel and i dished out couple of dishes out of this fantastic fruit. 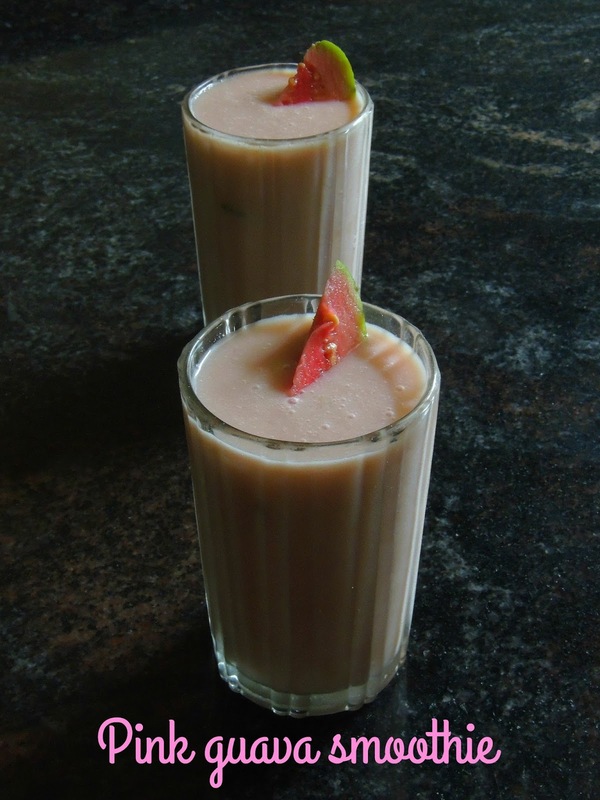 After making some juice, lemonade and lassi with both green and pink guavas, my today's post is this simple but yet a delicious healthy smoothie prepared with pink guava chunks with yogurt, rolled oats. Definitely this smoothie is a very refreshing drink and dont forget to make some if you get this tropical fruit easily. Zezette de Sète, is a delicious biscuits which have its origin from Sète, a beautiful city of France. Honestly i dont know about this popular biscuits which is quite famous in South France especially the cities and villages around Montpellier. 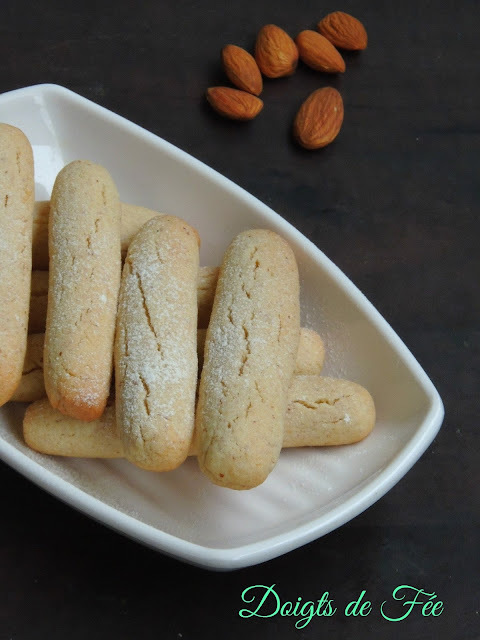 This Zezette de Sète is a trademark biscuits and this biscuits is made with easy ingredients available easily in your pantry except the White wine. Actually the addition of white wine plays an important role in this biscuits, though the alcohol gets disappears while baking. Needless to say that this White wine biscuits makes an excellent evening snacks to have with your favourite beverage.Usually flavored with vanilla extract, some bake their Zezettes even with Orange blossom water, however this biscuits are very simple to make if you want try something different from your usual bakes. 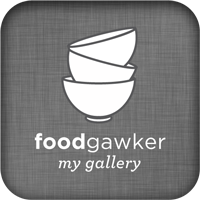 Frozen yogurt which is also known as frogurt or frozen yoghurt is a frozen dessert made simply with yogurt though sometimes other dairy products are also used. This frozen dessert is lower in fat and its quite different from the icecream. 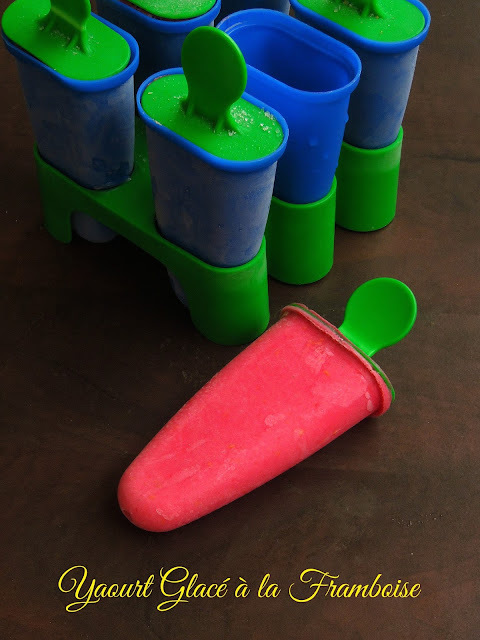 You can serve this icecream like frozen dessert is served with different flavors.Yaourt means Yogurt in French, frozen yogurt is quite a popular dessert in French cuisine. This frozen yogurt is seriously very easy to prepare as no cooking is needed. Varieties of frozen yogurt do exists and my today's frozen yogurt goes for raspberries. Summer fruits are showing their heads in every fruit and vegetable stalls. Raspberries and strawberries are easily available now, obviously i went with raspberries as i love this fantastic fruit. We all know how rich is a brioche, these French pastry bread asks for large quantity of egg and butter to give the rich and tender crumb. This bread may comes out light, more or less fine depending upon the butter and eggs used. Brioche is considered as a viennoiserie as much as like Pain au lait, croissants etc. Viennioserie are leavened baked goodies which is sweetened with sugar and enriched by butter and eggs.Brioche are commonly eaten in France for breakfast or as a snack with spreads or jams. You can dish out excellent bread pudding with brioche while some makes incredible French toast with brioche slices. Obviously this bread have their prominent place in every French bakery. Since ever i started baking at home, i have baked some brioche bread, though i have couple of popular brioches to give a try. 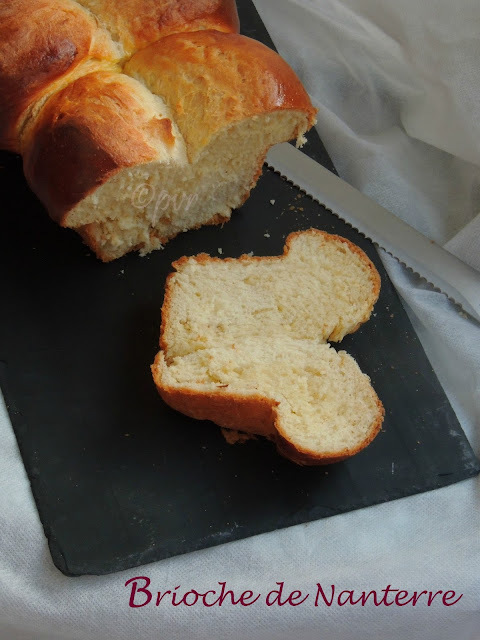 One among those famous brioche is this Brioche Nanterre. Hot Mulled wine is known as Vin chaud in French and this drink is quite popular in winter especially during christmas time. I tasted this mulled wine few years back while we travelled to Strasbourg, an Alsace city where christmas market is quite famous for their mulled wine. Though am not wine lover, i simply loved this hot spiced mulled wine and i was waiting to give a try to them at home as my Hubby was a great fan of this drink. Obviously when i decided to go with French cuisine for this whole month's blogging marathon under Journey through the cuisine as theme i found that for the Letter 'W' this mulled wine suits prefect as this drink is known as Warmer Win in Alsace.Vin chaud, this mulled wine is generally prepared with red wine, spices which is sweetened either with sugar or honey. 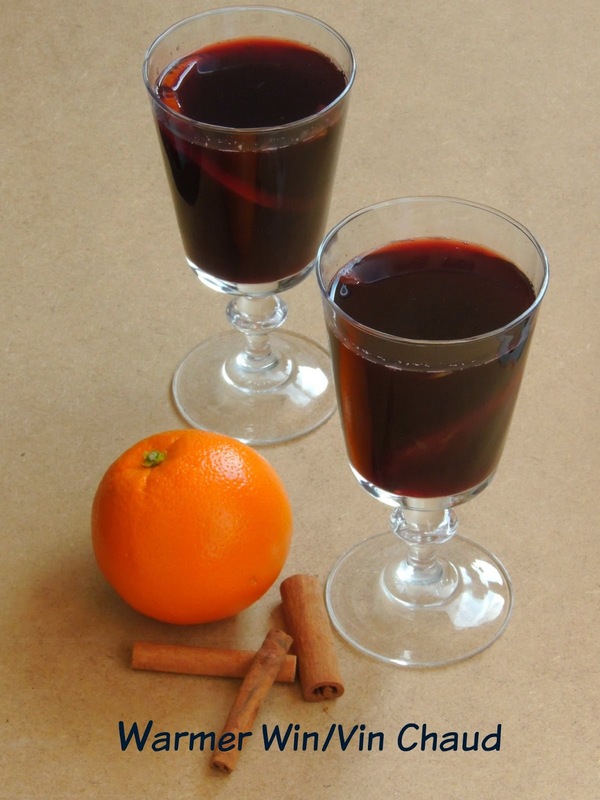 Many versions of Mulled wine recipes exists depending upon the region, family and chef. 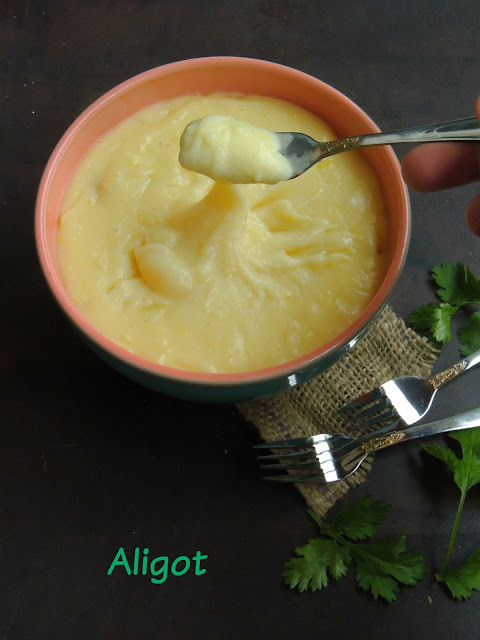 Velouté means creamy, silky like texture, most of the French soups are known for their silky and smooth texture as most of this kind of soups calls for creams. 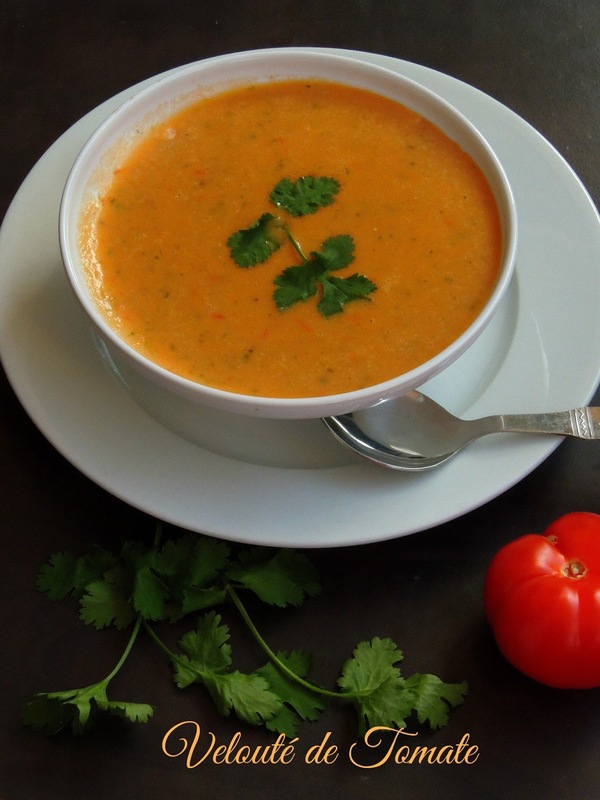 Today's post goes for a creamy tomato soup which is quite simple to prepare. You can simply finish your dinner or lunch with a bowl of this ultimate soup as this soup will definitely please your tastebuds and fill the hungry tummies easily. Soups prepared with vegetables can be made simply with a double cooking method, while this velouté versions are created to save time, to deduce the expense in professional kitchens where velouté is often kept aside to serve along with various dishes. Also to say the biggest difference between the Velouté and regular vegetable loaded soups is flour which is replaced very much with potatoes as main thickening agent. However the final product tastes as much as like the soup. Madeleine is a small cake which have its origin from Commercy and Liverdun, two divisions of Lorraine region in Northeastern part of France. This very small spongy cake have their own distinctive shell like shape as this cakes are baked in baking pans with shell-shaped depressions. Apart from the shape, this cake goes for an easy cake batter which is simply prepared with flours,eggs,sugar and butter, almost similar to the sponge cake but still this cakes have a lighter, airy texture. 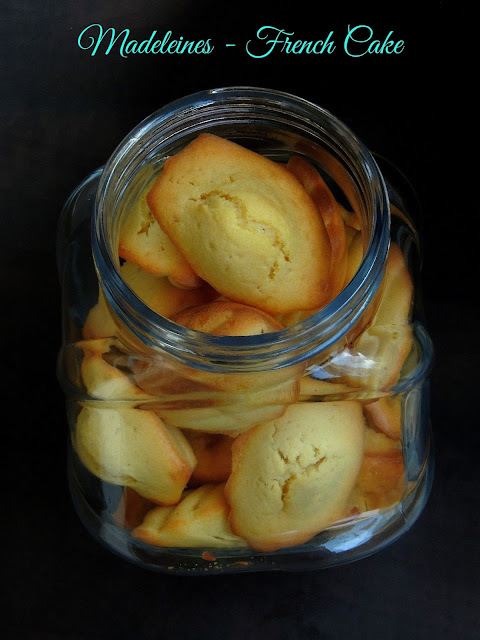 Some of the traditional recipes of Madeleines calls for grounded nuts usually almonds though some may go for lemon or orange zest to give a citrusy flavor to these cute and dangerously addictive small cakes. Cocktail buns aka Chinese Coconut buns has its origins in Hong Kong which is a sweet bun,filled with a buttery, milky sweet coconut paste. 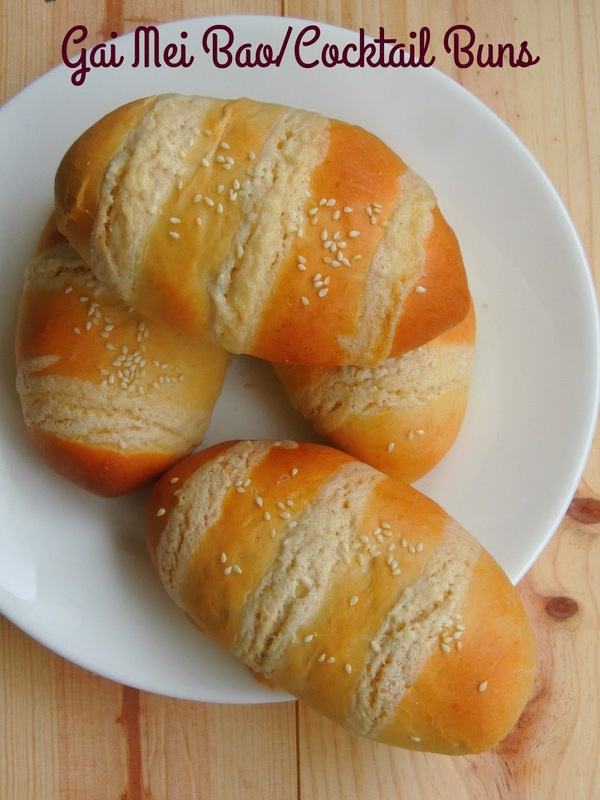 This bun was created some time in the 1950's in Hong Kong, when the owners of a local bakery were left with quite a few unsold but perfectly good buns.Then the owners ground them up with sugar to make a filling which was put into freshly baked buns the next day. While the original buns were made with filling made only from left over buns and sugar, some more creative bakers eventually added more flavour to the new buns by adding coconut, butter and milk to the filling. This has now become the accepted filling for these Chinese Cocktail/ Coconut Buns. Cheese is the most favourite of French peoples, being an Indian for me cheese was something we see or cook rarely in our Indian cuisine, obviously when i saw a section of varieties of cheeses at every provisional store i was completely surprised. I dont eat all the varieties of cheeses exists here, am very selective when its comes to cheese. My all time favourite is Emmental cheese which is mild in flavor almost like the cheddar cheese. Either grated or else sliced, this emmental cheese works awesome in anything and you can make varieties of dishes out of this beautiful cheese. 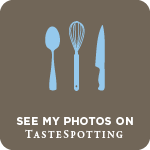 If you are a follower of my space, you might have noticed that i have been posting different dishes from French cuisine since three weeks as am running a month of blogging marathon with Journey through the cuisine as theme for this whole month's marathon. French cuisine have numerous salads and salad have their important place in every get together or else in everyone's daily meal. From traditional salads to innovative salads, French chefs never failed to surprise us or make us awestruck by creating many beautiful catchy salads. Obviously when i was searching for a recipe from French cuisine for 'S' i didnt hesitate a second to make some chilled salad for our weekend lunch. 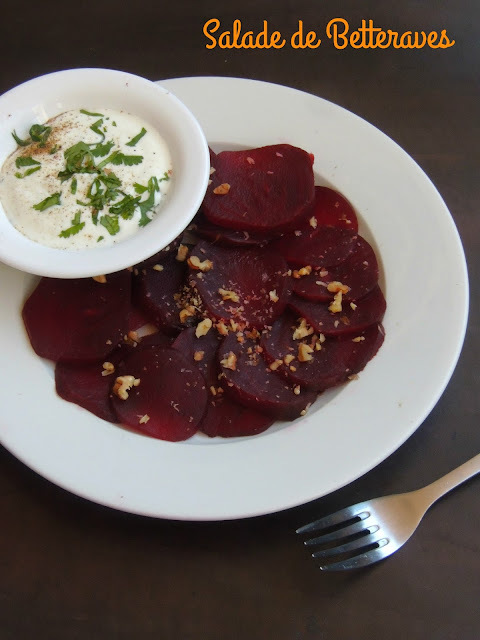 My today's recipe is cooked beetroot served chilled as salad with some crushed walnuts and a creamy yogurt sauce spiced simply with some herbs and pepper, salt. Trust me the nuttiness of walnut and the crunchiness of cooked beets will definitely satisfy your tastebuds. Ratatouille, this French provençal vegetable stew is a traditional dish which have its origin from Nice,though this stew aka Ragout is referred as Ratatouille niçoise, this dish quite popular among the entire Mediterranean coast as this dish is an easy summer dish. Since this dish is typically prepared as a stew especially with summer vegetables, this dish have their important place in summer lunch tables. Traditionally each vegetable is sauteed separately before which is layered as a baking dish and baked in oven. But now many versions exists, this dish is served as a side dish while serving a meal which is accompanied by either pasta, bread or else with rice. 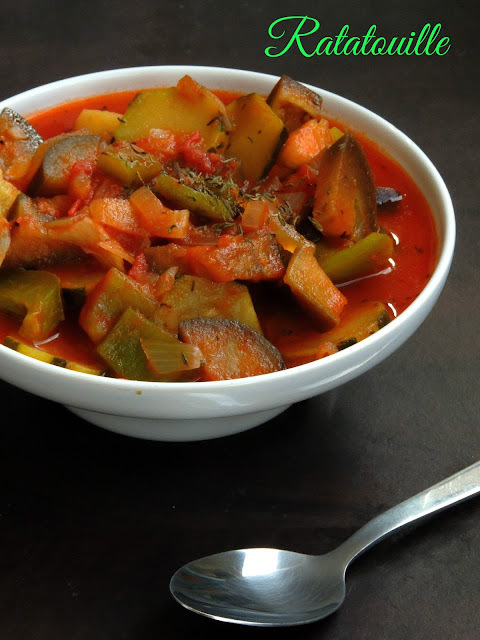 Tomatoes is the main ingredient for making this flavourful and aromatic dish,though vegetables like zucchini, eggplant, bellpeppers, onions, garlic plays an important role for making this fantastic dish. As i told earlier, many easy version of making this Ratatouille do exists and i followed one of the easiest method. Quatre quart in French means Four Quarters, which is a famous Brittany region Pound cake. This cake is very popular in France and whoever want to bake a cake with easy ingredients always stick with this cake as the ingredients are easy to follow. Four quarters means equal weights of four ingredients. 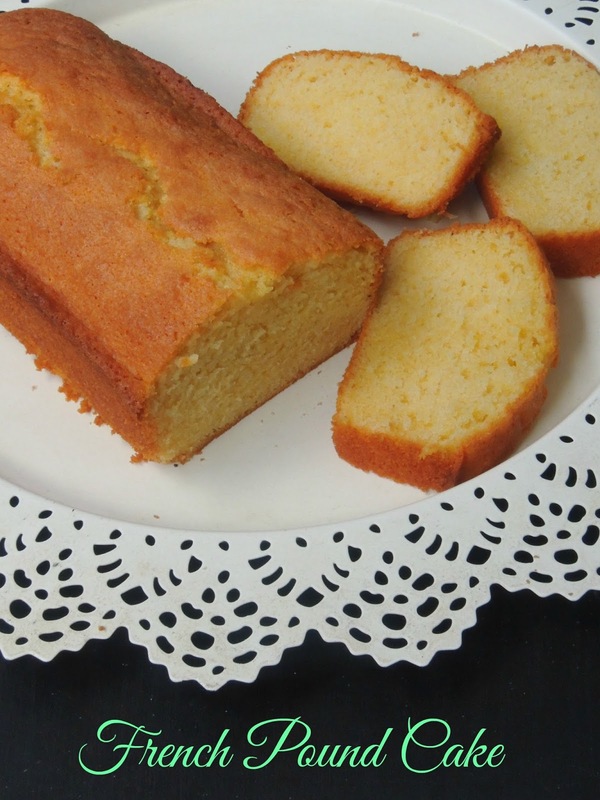 The main ingredients for this cake is Flour, egg,sugar and butter and all these four ingredients are used in equal weights to prepare this French pound cake batter. Quite easy to remember na. Even my first cake which i tried few years back after landing to France is this super spongy Quatre quart. Whoever novice in baking can bake out this super spongy cake with less efforts. If you are a follower of my space, you might have noticed that am posting different French dishes in alphabetic order for this month's long blogging marathon. Today's alphabet is 'P' and am sharing an easy breezy French style of pan fried potato cake. Not to get confused with galettes de pomme de terre, an another crispy potato cake. Actually Pomme de terre in French means Potato, we learn this vegetable name very easily even if you dont speak French. Yes French people's staple food is Potatoes, obviously variety of potato based dishes exists in French cuisine, and still many more dishes are yet to try in my kitchen. Today's post is one of the traditional dish which is quite famous in Lyon. A popular city of gourmands, Lyon is famous for Bugnes, salads and many more delicious dishes etc. 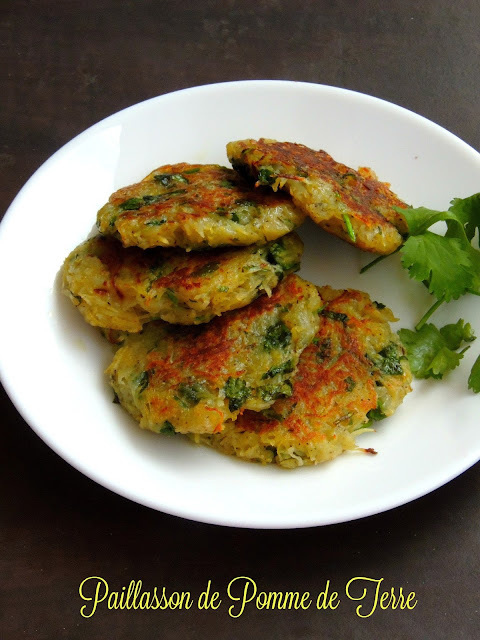 This potato cake are very easy to make, no need of eggs or flour. Just grated potatoes when spiced with pepper powder, salt and herbs makes this ultimate cakes. Though i know many beautiful French desserts prepared with eggs, my today's post is my all time favourite. I had an immense chance to taste this super delicious pudding during one of our summer trip to Charente region of France.Though this Baked pudding ressembles as much as like crustless French Flan, somehow i found that the taste of this baked pudding is quite different from the Flan. No flour is needed obviously eggs plays an important role in this pudding. Just with four ingredients, you can simply whisk this dessert with less efforts. Even a kid can prepare this delicious pudding with the help of an adult as this pudding calls for baking. Once finished baking, this baked beauties are arranged in fridge before serving, this pudding when served chilled makes an excellent dessert after a meal. 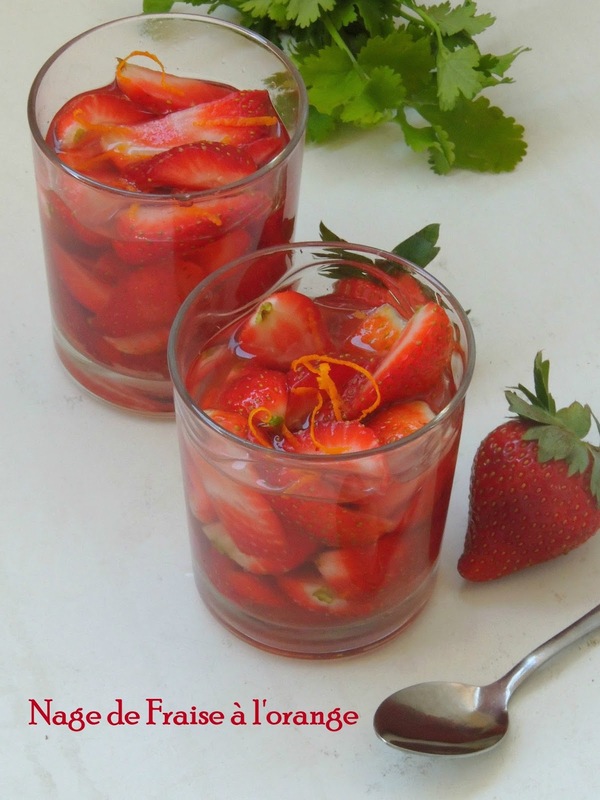 After few traditional and baked goodies from French cuisine, my today's post is an another interesting, easy breezy dessert with loads of strawberries. I have been baking a lot for this month's blogging marathon as i picked French cuisine for Journey through the cuisine. Since most of my dishes went for baking, i couldnt resist to give a try to this simple,definitely a refreshing dessert after a heavy meal. Strawberries are showing their heads slowly in most of the fruit stalls here. Spring is here, needlessto say most of the seasonal fruits will be available easily everywhere,i just love this season especially for the variety of fruits, this season gives to us. Strawberries, this fruit is our family favourite, obviously when this fruits comes to market i will never forget to get this fantastic fruit. When i was searching for a French recipe's name starts with 'N' through google master, he showed me couple of recipes but i sticked with this simple fruit loaded dessert. 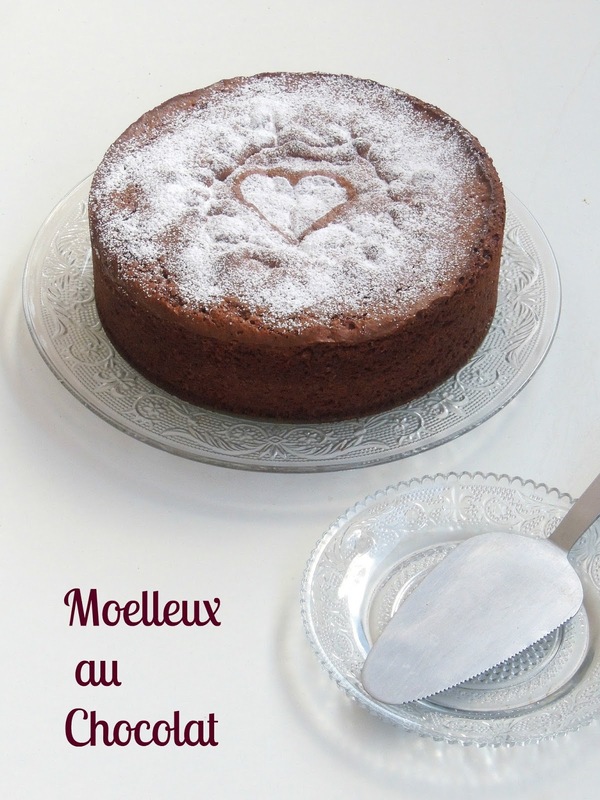 Moelleux au chocolat, which can be translate for English speakers as 'Softness in the Chocolate house' is quite an easy cake with four main ingredients. Egg,butter, chocolate and sugar along with less quantity of flour. Most of the moelleux au chocolat goes for all purpose flour along with cornflour or else simply with corn flour. This cake goes for less time to get ready. To prepare this cake, both the butter and chocolate are melted together, while the egg yolks whisked with the sugar to form a thick paste, which gives a denser finished product, and while the egg whites separated from the yolks are whipped to peak to make a lighter cake when this cake mixture is baked. However this cake makes an excellent dessert to serve after a meal, when served along with pastry cream or simply topped with whipped cream, one can enjoy thoroughly this ultimate cake. Desserts have their important place in French cuisine. Seriously after coming to France, i learned how eat a meal and finish with a dessert. Basically we Indians doesnt matter about desserts and we finish mostly our meals with a fruit. But French peoples always need their dose of desserts and needless to say the varieties of desserts exists in French cuisine. The top most French dessert is always Chocolate mousse and the main ingredient for making most of the desserts is 'Egg', however my today's recipe goes for an eggless Chocolate dessert topped with whipped cream. 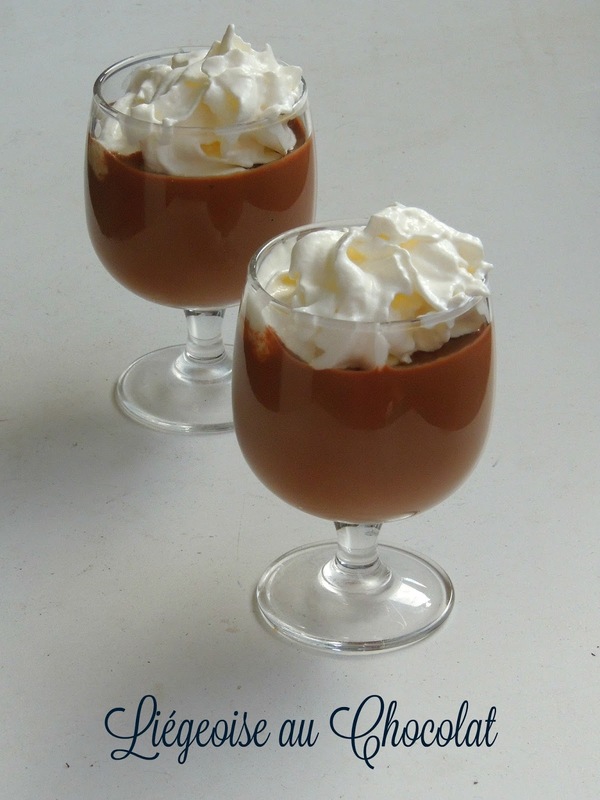 Coffee Liégeoise is the most popular French dessert but since French peoples are crazy about chocolate in most of their desserts,chocolate liégeois do exists. Actually this dessert is prepared with eggs,melted chocolate and sugar topped with whipped cream. But my today's recipe is quite different, instead of this eggs loaded mousse like dessert,i went for an eggless chocolate cream topped with whipped cream. 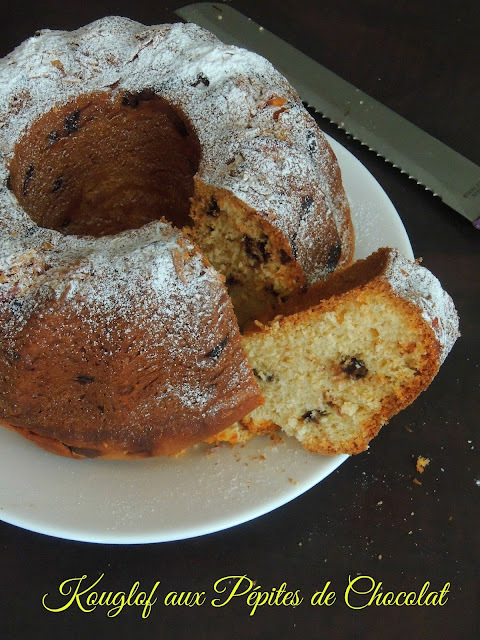 A kouglof (in french) aka Kugelhopf or Gugelhupf is a Bundt cake which is well known in Alsace region of France and in Southern German, Austria and in Switzerland. Gugelhupf or Kugelhopf is a big cake and has its distinctive ring shape. Usually prepared with soft yeasted dough, this cake will always contains raisins, almond and cherry brandy, while some have candied fruits, nuts, not to forget that some regional varieties from Hungaria, Czech and Slovak are filled with sweetened ground poppy seeds but however many variations do exists. 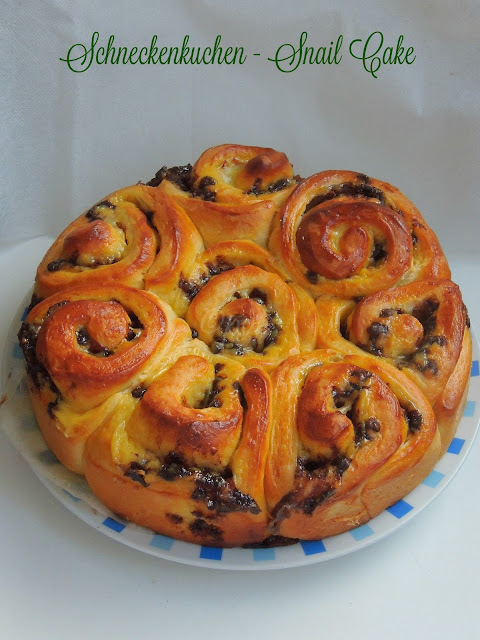 I have already tried a Savoury version of Kugelhopf with vegetables, but my today's Kugelhopf goes for chocolate chips. Though this yeasted cake have a dense bread like texture, the dough is prepared almost like a brioche dough. When i baked the savory version of Kugelhopf i couldnt find the traditional pan of this Alsacian bread, now i have this special baking pan at home which i bought recently as a new addition to my baking pan collection. 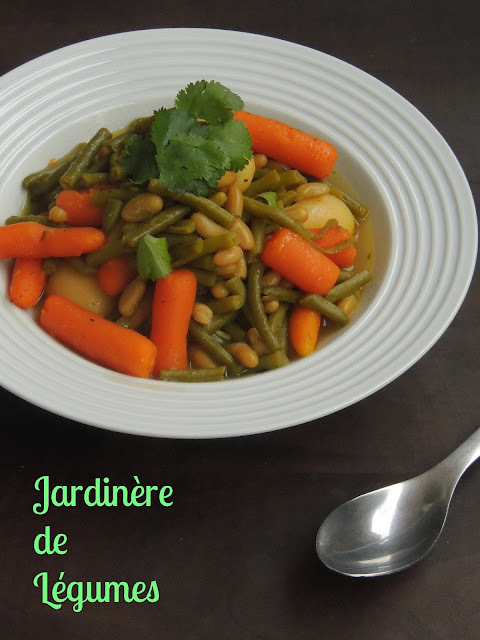 French stew goes mostly for meats, however many vegetarian versions do exists and one among those vegetables loaded stew is this Jardinère de Lègumes. Légumes in French is Vegetables and not to mistake the word 'Legumes' with the protein rich beans varieties. This stew is seriously very easy to make, with fresh vegetables you can dish out this healthy and very colourful stew simply with butter, and flavoured with herbs along with vegetable broth. Usually during the peak season of fresh peas and young carrots, this stew is quickly prepared at home to serve along with mashed potatoes or else with grilled meats. However you can get canned Jardinère de Légumes or else frozen bags of this mixed vegetables easily from the provisional stores. Young carrots, fresh green peas and baby potatoes are usually used for making this popular French mixed vegetable stew. But still you can mix and match any seasonal vegetables available easily to prepare this colourful stew. 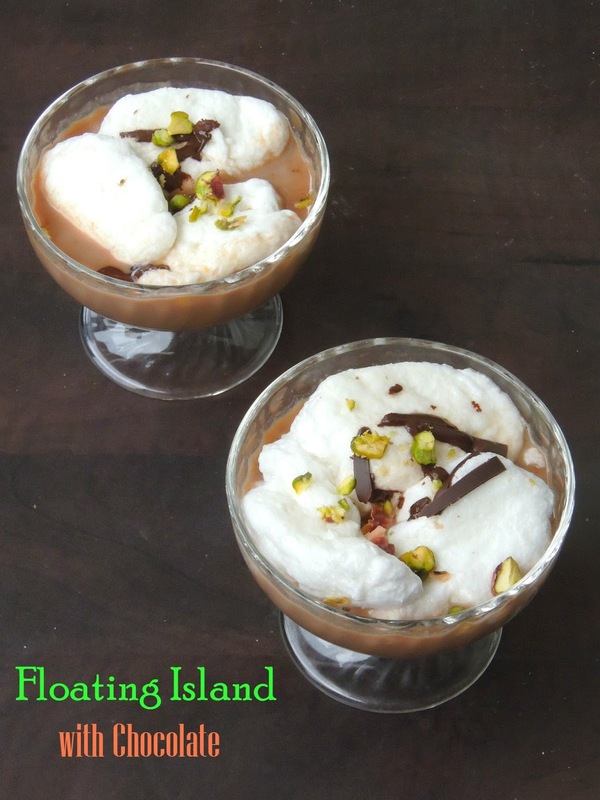 Île flottante is a delightful French dessert which is also known as Floating island. Egg whites when beaten as meringue dropped into a créme angalaise aka a vanilla custard sauce. When meringue cooked dropped into to this sauce starts floating and ressembles as much as like floating islands. This desserts is our family favourite and since ever i started making myself at home, my family asks me quite often to make this dessert. And i have been preparing this dessert at home quite from a long as this dessert asks for easy ingredients, but still i have few more versions to try. My lil one was asking for a chocolate loaded floating islands since a long and finally i prepared some few days back for a small get together we had at home. Floating island is made of egg whites and which is served along with a silky milky custard sauce. Some makes their custard sauce thicker and serve on the top of the dumpling but most of the recipe calls for almost liquid, thin custard sauce to make the dumplings float on the top of the sauce. Hachis Parmentier is a well known French dish made usually with mashed potatoes, along with meat cooked in a sauce which is later served together after baking for a meal. This baked dish goes for cooked meat in sauce, layered and topped with mashed potatoes which is simply topped again with bread crumbs or else with cheese. 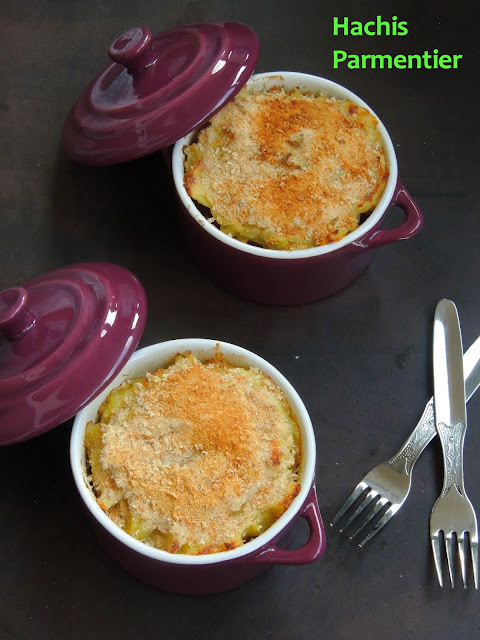 This dish is a simple version of Cottage pie or shepherd's pie of French cuisine. The word Hachis means minced or chopped, since this dish goes for minced meat, this dish is named as 'Hachis' but the name 'Parmentier' comes from a French Pharmacist and Nutritionist called Antoine-Augustin Parmentier, as he proved during 18th century that potatoes are edible to the world. 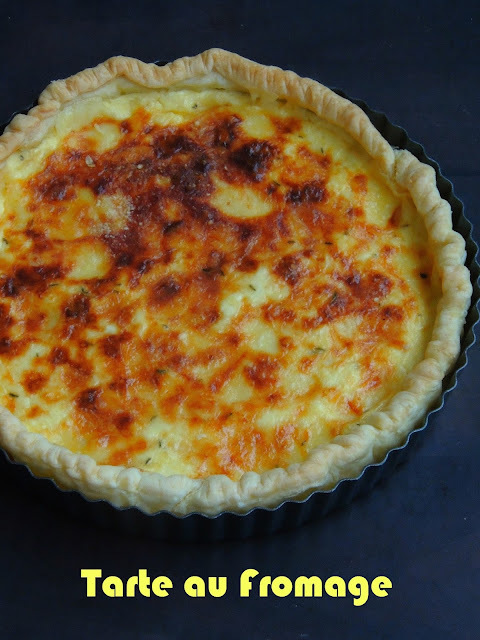 Since Potatoes plays an important role for making this French pie, this dish is named as Hachis Parmentier. Traditionally this dish calls for minced beef meat topped with mashed potato puree, but my version is completely vegetarian. 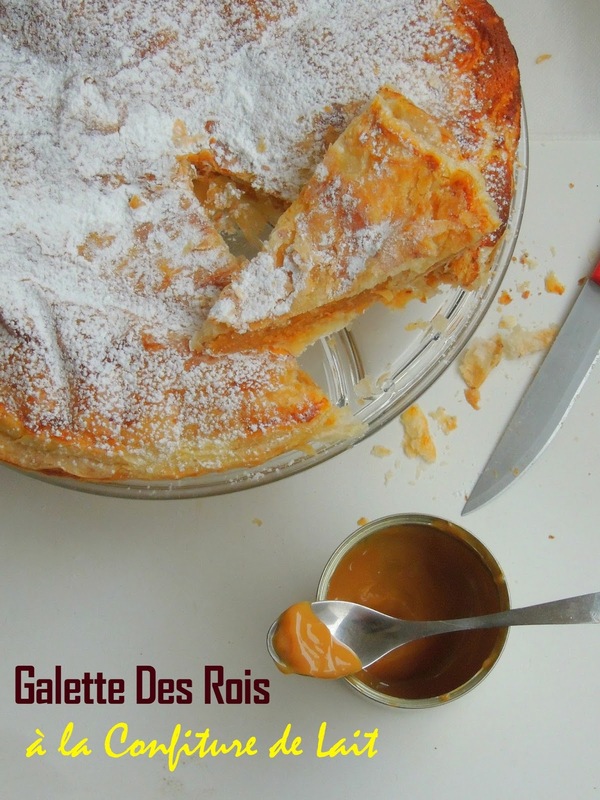 Galettes de Rois is well known as King's cake in France, this cake can be called as three kings cake,king cake, king's cake and its easily available during the festival of Epiphany at the end of the Christmas season. Traditional King's cakes are made of sweet brioche dough in the shape of a hollow circle with a glazed topping sprinkled with coloured sugar. Though this yeasted brioche bread style of king cake do exists, king cakes are also made with puff pastry sheets, filled with a delicious fillings along with a small figurine hidden inside. The most well known filling of this King's cake is frangipane filling which is prepared usually with almond powder, however now many King's cake with different fillings are easily available in stores. Every year, these King's cake have their important place in every home especially after New year.Many people says that the small figurine hidden inside the cake represents Baby Jesus, but now the figurine changes from Bakery to bakery and often represents a hit movie or other cultural icon. Far Breton aka Breton far is a traditional cake or a dessert from Brittany region in France. This dessert ressembles almost like the popular Clafoutis, an another dessert which goes for a flan style egg and milk custard with flour. Usually dried plums aka prunes and raisins are added to this traditional Brittany region cake. However you can skip those usual prunes and raisins, by adding apple chunks. 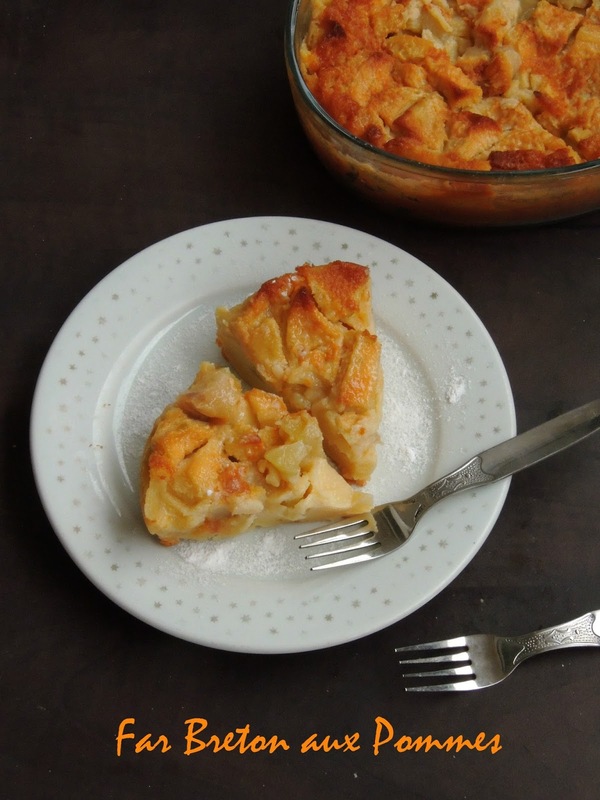 Yes you can bake this ultimate cake or dessert with apples, i just love this Apple Far Breton which i tasted long back during our summer trip to Brittany region. Far breton served in Britanny is often cooked to a much burned appearance than the recipes you can find in online, however i love mine with a golden brown top. French pastries are very much well known around the world. After croissant, the most favourite pastry of mine is éclairs especially with chocolate. An éclair is an oblong shaped pastry made usually with choux dough which is later filled with a cream and topped with a simple icing. Choux pastry goes for simple ingredients like flour,egg,butter and water. 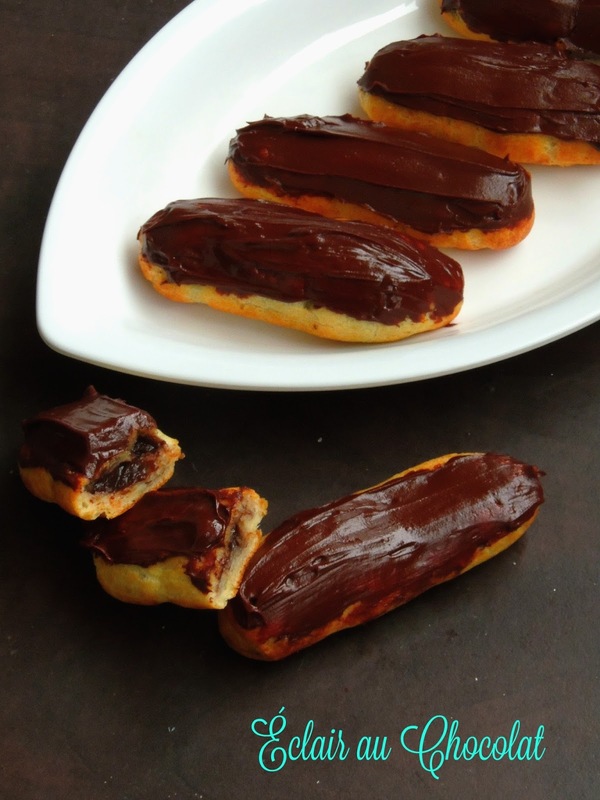 Yes this choux pastry dough is typically piped into an oblong shape with a pastry bag and baked until it turns crisp which sounds hollow inside. Once this baked oblong shaped pastry gets baked, they are filled with either vanilla, chocolate or coffee flavoured custard cream or else simply with whipped cream. However the modern versions of fillings varies from fruit fillings to nut fillings. Since i dont want to change anything, i just sticked with my all time favourite chocolate éclair. After a delicious and quite an alluring bread, today's post is going to be an another interesting baked goodies which i crossed in a French site while i was searching for a dish name starts with 'D'. 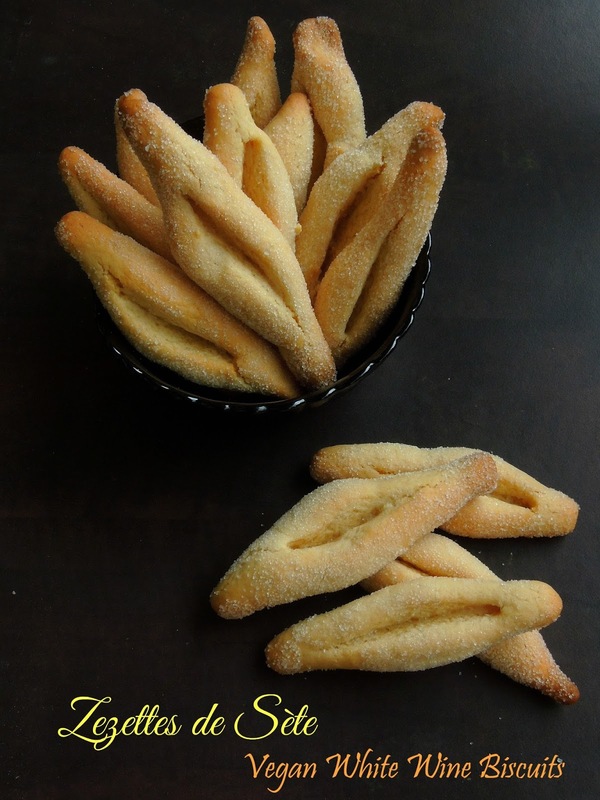 I completely fallen in love with this cookies as they ressembles quite like the Lady's finger biscuits which is much needed for making Tiramisu, but trust me the ingredients you need for making this ultimate Doigts de Fée is compeletely different from the Lady's finger biscuits. While googling, i found that this biscuits have its origin from an ancient Morroccan biscuits, which is later carried towards France. Still none is able to give exact Origin of this cookies, however its doesnt matter coz France is a multicultural country and its not a surprise at all. Chinois is a traditional pastry from Alsace region of France which have its border with Germany, this snail shaped cake have its origin from Germany where its known as Schneckenkuchen aka Snail cake because of its shape. But none know about the reason behind the name Chinois which means chinese in French, this is how this yeasted bread like cake is called in France. This brioche is one of my favourite since ever i tasted it long back in a friend's place. Though this delicious chinois do exists in stores, this rich yeasted cake is very easy to bake at home. We all know that brioche dough asks for a time consuming preparation, long kneading process, but trust me this brioche cake will definitely please your tastebuds. This Snail cake makes a family sized brioche which is rolled around a pastry cream filling, to which you can add dry fruits like raisins or else chocolate chips. If you tastes this spongy,succulent Chinois, am sure you will completely fallen in love with it. After Aligot, the popular French regional style of cheese loaded mashed potatoes, am taking you all to enjoy virtually an another popular fried pastry dough called Bugnes which is well known as Angel wings. 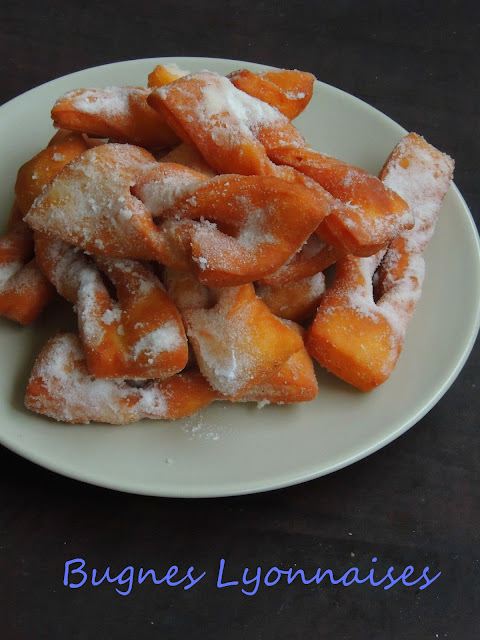 This bugnes are a traditional sweet pastry made out of the dough that been shaped into twisted ribbons, which is deep fried later and sprinkled with powdered sugar. Though this Bugnes is traditionally present in many European cuisine with many different names, it have been incorporated into other regional cuisine by the immigrants. This pastries are eaten during the period before Lent, a religious observance begins on Ash wednesday and covers a period of six weeks before Easter Sunday. Not to forget that this Bugnes are eaten during carnival as well. This month is going to be completely French cuisine. We, the blogging marathoners are kick starting this April month's blogging as a month blogging with Journey through the cuisines as this month's theme. Every year, we make sure that both April and september as a whole month of blogging marathon with different interesting themes. Again this year we are going to run with 4 weeks of blogging marathon either with regional cuisines or with International cuisines. Without any hesitation, i went with International cuisines and i picked French cuisine for this month's blogging marathon.Apart from X and U alphabets, it was quite easy for me to pick dish's names starting with remaining Alphabets.For the first day of this month's blogging marathon, i went with this ultimate cheese loaded mashed potato called Aligot. 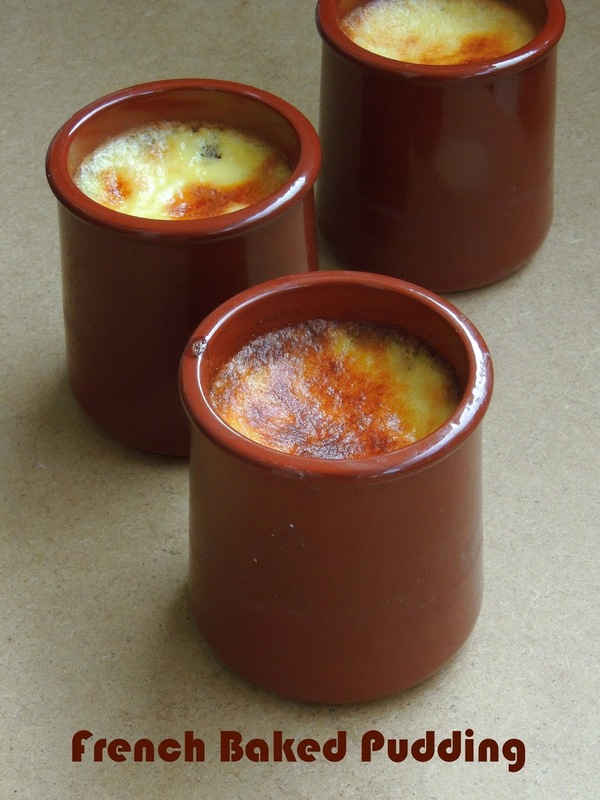 This dish is quite popular in L'Aubrac (Aveyron, Cantal, Lozère, Midi-Pyrénées) region in southern Massif Central of France.